Marinate the meat for 24 hours in the white wine with the sage leaves and the bay leaf. Sieve the marinade and put it in a pan with 1 tablespoon of olive oil and 2dl of water. Bring to a boil, put the meat in the liquid with the battuto and let simmer for 30 minutes. Add the anchovies and continue to simmer for another 30 minutes. Turn off the heat and let the meat cool in the cooking liquid. Wrap it in cling film and let it get thoroughly cold in the fridge. Sieve the cooking liquid into a pan, and let it reduce to 2 1/2 dl. Let it cool down completely. Put the tuna with the egg yolks and the cooked anchovies in a blender. Add half of the capers, the lemon juice, the vinegar and the olive oil and blend. Thin down this mixture with 1 1/2 dl of the cooking juice. Aim for a relative thick consistency, and taste for salt and pepper. Cut the meat in thin slices, and put on a serving dish. Cover with the sauce, and garnish with the remaining capers. Let rest for a few hours in a cold place (or overnight in the fridge, but do take it out before serving to come to room temperature). Although vitello tonnato is an antipasto dish, it can be perfectly served as a light lunch. Serve with a nice white wine, such as Arneis, a Vernaccia di San Gimignano or a Greco di Tufo. Cover the meat with water and let it boil with cleaned, chopped carrots and celery, a whole peeled onion and herbs for about 1 hour until the meat is tender (it depends on the cut). Leave the meat to cool in the soup and put it in the freezer for a couple of hours, if you want wafer-thin machine-cut slices. Don’t throw away the filtered soup – it may be used to water down the tuna sauce or as a base for minestrone. 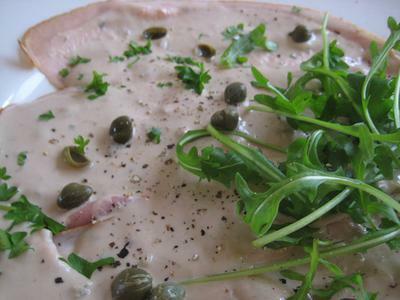 Blend dried canned tuna with mayonnaise, lemon juice, olive oil, capers and anchovies. Add soup from the veal to obtain the right – not too thick – texture. The sauce should be a little runny to amalgamate with the meat. Slice the veal thinly, arrange the slices in layers and cover each layer with tuna sauce. Leave the dish in the refrigerator to rest for a couple of hours. Decorate with slices of lemon and capers and serve with plenty of nice bread for scarpetta. 1. Tie the roast together with kitchen string. Fill a heavy based pan with water and season with salt. Bring to the boil then add the meat,wine and vegetables to the pan. 2. Cover and poach gently for approx. 1 hour. Take the pan off the heat and allow the veal to cool down in the broth. 3. Wrap in clingfilm then place in the fridge till completely cold. 4. To make the sauce, blend together the tuna, anchovies,egg yolks and capers. Pour in the lemon juice and olive oil and blend till almost smooth. Add the broth bit by bit till you have a nice spreading consistency. 5. Season with salt and black pepper. 6. To serve, cut the veal into thin slices and arrange on a large serving plate. Coat with the sauce, sprinkle with whole capers then cover and place in the fridge to marinate for a few hours. Allow the veal to come up to room temperature before serving. One of my fabourites but didn^t realize it was so hard to make. I would be glad to have a simpler version if anyone has one.